WHAT IS IT? Alpinestars’ Supertech M10 helmet has been in the works for the last five years. 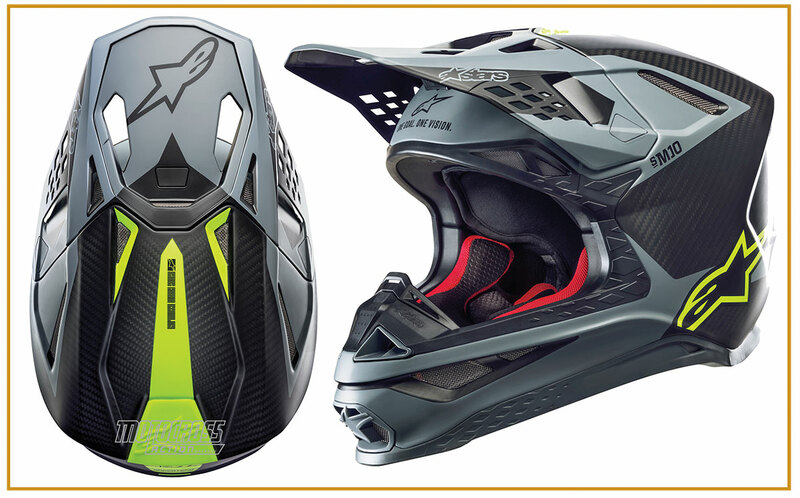 Alpinestars took its time in an effort to create the most advanced, lightweight, well-ventilated helmet possible. It’s now available at your local dealer. WHAT’S IT COST? $649.95 (Meta), $579.95 (solid color). CONTACT? www.alpinestars.com, (800) 409-0903 or visit your local dealer. WHAT STANDS OUT? Here’s a list of things that stand out with the Alpinestars Supertech M10 helmet. (1) Fit. The Alpinestars M10 helmet has different shell sizes to match the available helmet sizes. There is a cavity for the AMA Pro mandated Hats Off device (all you have to do is remove the foam insert). 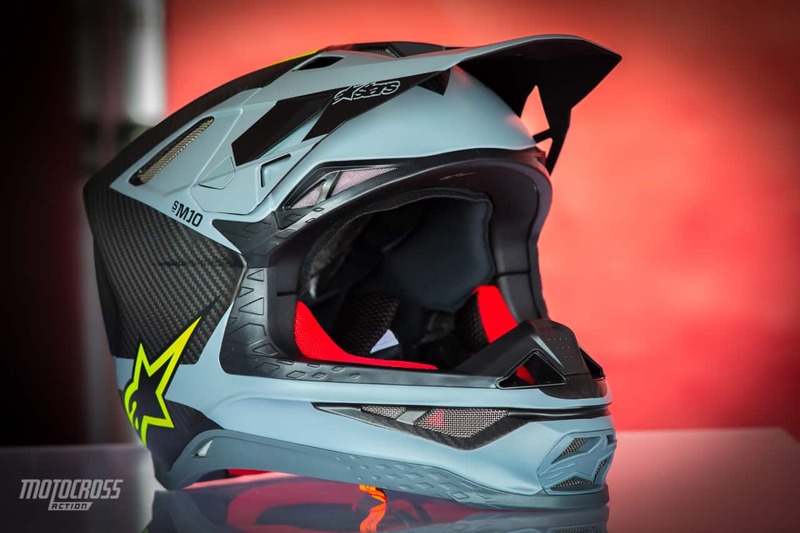 Alpinestars’ A-head fitment system allows the rider to fine-tune the angle at which the helmet sits on his head for comfort and goggle positioning. Every MXA test rider liked this option, and even if they didn’t always need it or use it, they had the option. (2) Craftsmanship. Alpinestars has always been a company that sweats the small stuff, so it’s no surprise that they finessed every detail on the M10 Supertech helmet. Appearance is a big part of their identity. It was important to them that the helmet look slick, sleek and compact. 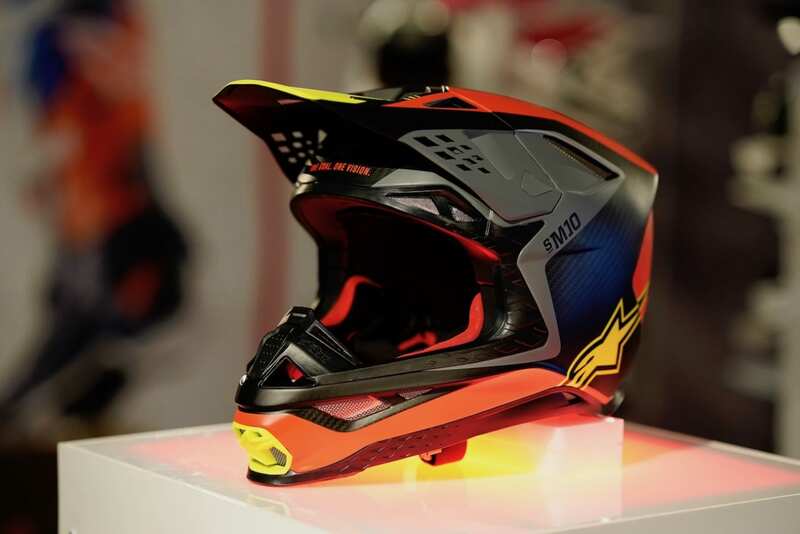 They designed a patented visor release system that eliminated the visor from catching in the ground during a crash and wrenching the rider’s neck. Equally important is the sculpted base of the helmet where energy-absorption pads are built in at the exact spot where the helmet might strike the rider’s collarbone. (3) Function. The ERS (Emergency Release System) allows safe removal of the cheek pads while the helmet is still on. It is especially important because it gives emergency responders the ability to pull the helmet off without causing further injury. The Alpinestars Supertech M10’s helmet shell is a composite of high-density carbon and Aramid fibers that houses an inner four-part multi-density EPS liner and MIPS system. (4) Performance. At 2.8 pounds, the M10 is very light. Alpinestars’ engineers did heat tests to determine where air should be ducted through the helmet’s interior for maximum ventilation. Overall test riders were pleased with the Supertech M10 helmet. The adjustability helped fit all the various different skull shapes of the MXA wrecking crew. The sound level inside the helmet was average, while ventilation was very good. We put 23 hours into testing it and had no issues with durability in that time. WHAT’S THE SQUAWK? Three complaints. (1) The top vents on the front piece of the chin bar had no screen in them. They fill with mud quickly. (2) The vents on the top front of the helmet didn’t sit flush, which allowed mud to pack onto the helmet. (3) Its looks aren’t everyone’s cup of tea; it is more space-age than organic in shape. MXA RATING: The Alpinestars Supertech M10 helmet is DOT- and ECE-approved. It features a multi-density foam liner, composite shell, MIPS rotational impact device, impact release visor system and comes in six different sizes. There is no doubt that the styling, design and construction are cutting edge.